At Annapurna Indian Dance we are passionate about sharing the rich artistic heritage of India, and its inspiring culture and traditions through performances and workshops. We specialise in bringing alive the well loved stories from the ancient epics and mythology of India, using the vibrant traditional dances with storytelling, music, drumming, puppets and masks along with beautiful costumes. Our workshops help you to explore the rhythms of dance, with its many fascinating hand gestures and stylised facial expressions for communicating ideas and feelings. Our dance workshops are a fantastic opportunity to appreciate and enjoy the graceful and rhythmic movements from traditional ancient dances and also understand more about Indian culture. You will work creatively and learn to tell stories using facial expressions and hand gestures. We offer a range of movement ideas from classical to folk using original Indian music. 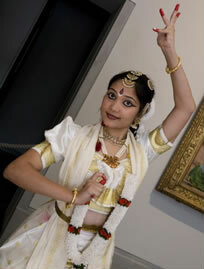 Annapurna Indian Dance has a strong and unrivalled record of dance work in Education especially in Yorkshire. In Education all our projects aim to promote a greater understanding and appreciation of the cultural traditions from India through innovative ways and increase awareness of racial, cultural and social issues. "I am delighted that Leeds schools have had the opportunity to work with this wonderful company. Annapurna Indian Dance are truly professional and they bring all the vibrancy and magic of Indian culture into school. The company use dance, masks and drumming to tell very powerful traditional stories that engage both children and adults. Teachers have really benefited from the company's training sessions, learning new ideas and simple techniques which they can use in the classroom. The feedback from teachers has always been extremely positive. For anyone who hasn't worked with this company – I recommend they do." Our project “Soldiers of the Empire” is about the contribution made by soldiers from undivided India who supported the British Empire during World War I. During our visit to your school we talk about these forgotten soldiers, touching upon the historic, positive relationship between Great Britain and the Indian subcontinent. In this workshop we will also share a beautiful Indian dance for world peace and harmony and teach children the many hand gestures and rhythms of the dance. Ramayana is a colourful journey to ancient India where the kings are called Maharajas and the tropical jungles come alive with lotus flowers, dancing peacocks, jumping deers, monkeys and elephants. Princess Sita is the only daughter of the great king Janaka and he wants to find the right husband for his beautiful daughter. There is a heavy Golden Bow given to him by the gods. Janaka issues a challenge and invites all the suitors across the land to come to his palace to see if they can lift this heavy bow. Who will be the winner? It is none other than the handsome Prince Rama! We offer an enjoyable interactive demonstration and workshop with dance, music and storytelling to bring alive this wonderfully rich ancient story from India. Tales From Mystic India: A beautiful journey to colourful and mystic India! Annapurna Indian Dancers present a rich garland of traditional dances and ancient stories from India with stunning costumes and original music . Annapurna presented a choice selection of classical and folk dances with sparkling stories from India. The Company toured 20 schools across West Yorkshire. Principal dancer was Priya Sundar, other dancers involved were Abhinandana M K, Mansi Dabral and Devika Rao. "What a super afternoon we had with the dancers from the Annapurna Indian Dance Company. They talked us through each of the dances explaining the signs they used to represent the different animals and birds of the jungle before performing each dance. At the end of their performance they asked me if they could have some more time and of course I said “Yes”. Little did I realise that the consequence of that reply was that I would be dancing an Indian Dance with the other teachers! The children thought it was hilarious and I have to confess we all enjoyed doing the dance. After the performance Mr Poppleton’s and Miss Catalfamo’s children had hour long Indian dance workshops which they were really enthusiastic about." David Wright, Headteacher, SHAY LANE PRIMARY SCHOOL, WAKEFIELD. Annapurna was very fortunate to have invited dancers Vidwan Chandra Shekhar Navda and Anjali Khandige along with storyteller Sumathi Niranjan from India for this unique project which explored the use of classical Bharatha Natyam with Yakshagana folk dance and the use of masks and puppetry for the story of Diwali . Principal dancer was Devika Narendran Rao, other dancers involved were Santosh Mennon and Priya Sundar. Inspiration India was one of our most ambitious project and it brought together three major artforms of the country - the dance style of classical Bharatha Natyam and Yakshagana(folk dance from Karnataka state of India) with puppet theatre called Yakshagana Gombeyata which used marionette puppetry . In schools we mainly explored the popular story of the monkey king Hanuman and how he developed confidence within himself to achieve success in life. The company was very proud to have invited dancer Anjana Rajan and Master Puppeteer Bhaskar Kamath and his assistant Manjunath Maypady from India for this special project . Principal dancer was Devika Narendran Rao. Bhaskar Kamath also brought many other interesting puppets which he had made himself and were greatly appreciated by all the children in every show. Original music composition for dance and spoken rhythmic syllables were given by Vidwan Chandra Shekhar Navda, (from Mangalore in India) for the project. Mangalam is that feeling of auspiciousness when everything is right in your world –you can achieve anything and are at peace with everyone. The project concept was to highlight the importance of peace and harmony in the world . Using classical Bharatha Natyam and Yakshagana folk dance, live drumming with storytelling , we developed on one of the powerful stories called Ten Incarnations from the ancient Indian mythology to explore the issue of bullying and the need to curb the greed for power. Artists included the renowned Yakshagana dancer / teacher, Sanjeev Suvarna and Ramya Chitlur, a highly talented and emerging Bharata Natyam dancer and singer from Bangalore. 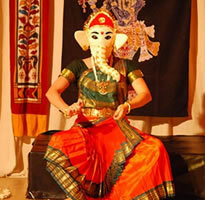 Principal dancer and storyteller was Navya Rattehalli . Sanjeev Suvarna also played the hypnotic drum called Chande in the shows. Dancer Devika Rao performed in many shows in this tour.